"On a bed of nails she makes me wait"
It was obvious pretty much from the start that U2 were setting out to be the most important band in the world, not necessarily the most famous or the richest, but the most important band in the world. And there are some who would argue that they actually achieved this goal. The songs not only reflected a highly original style, they were passionate to the extreme and generally covered much deeper subject matter than most other songs out there. Following is nonhollywood's list of best U2 covers, see what you think. If you like this list check out our other lists of covers by great artists such as R.E.M. and The Cure (song previews provided courtesy of iTunes). Here's a guy who's recorded about a million covers... and pretty much all of them are terrific. The emotion on this one--I mean, let's face it, Bono is one of the most emotional singers around, so if you're going to cover U2 it really helps to nail the emotion, which Mike does here, even despite the kinda rude audience chatter going on in the background during this live performance.Buy it on iTunes (or hear longer preview). The spartan arrangement of this one works really well. Again, another vocalist who can deliver the emotional goods, and that's what I'm looking for, especially in a U2 cover. Buy it on iTunes (or hear longer preview). There is another page on this website where I absolutely gush about Trespassers William, so I won't go there on this one (though I really love Trespassers William). I'll just say that I hope you agree that their slow, dreamy version of Love is Blindness is just way cool. Even though it is not my favorite U2 song, I still think that this one is way cool. Buy it on iTunes (or hear longer preview). This has always been one of my favorite U2 songs. It's been a long time since I've been to one of their concerts, so I have no idea if they still end every show with this one, but I know that I love the song. And this version which appears on a charity album for the Congo has a really cool approach that I like: in a way it's pretty much like the original (all echoey and such), yet it still manages to feel quite a bit different than the original. Perhaps it's the delicate female vocals. But I really like it. Buy it on iTunes (or hear longer preview). 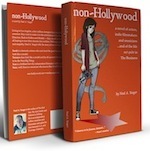 Check out the novel non-Hollywood! Are you the type of person who supports indie? Great! You're exactly what we're looking for in a reader for the novel non-Hollywood. "I've spent a lot of time in the indie world," says author Neal A. Yeager, "From working on indie films, to recording my own music, to distributing my own books, to running the web site nonhollywood.com I've definitely been there! And for a long while now the idea of writing a novel based in that world has been bouncing around in my head. In fact, the book has been written, in bits and pieces, over the course of a decade." And now you can read it! Though U2 had been gaining a bigger and bigger audience with each album, it was With or Without You that turned out to be the first gigantic super-hit of their career. So, it is only natural that there are many, many covers of this song. In my opinion, this one by Amy Sky is the best of the bunch: a gentle piano touch and deep, forlorn and tortured female vocals. I love it. Buy it on iTunes (or hear longer preview). This is a fantastic string instrumental version from classical artist Rachel Barton. I'm a fan of strings and one of the things that I've always enjoyed about classical music is the way that classical composers often take several different melodies and counter-melodies and weave them together--something about hearing all of those different parts going on always thrills me. So I was thrilled when I heard this arrangement of Sunday Bloody Sunday which applies a classical string quartet feel to this emotionally impactful tune. Buy it on iTunes (or hear longer preview). ...and here's another way cool one, Martine's voice is saturated with emotion in this straight-ahead acoustic cover. Very nice. Buy it on iTunes (or hear longer preview). As you've probably guessed, I really love this song and I'm so happy to have found a few covers that do it justice. This acoustic cover from Jamestowne hits it just right, leaving me with that same "desert-y" feeling that was evoked by The Joshua Tree but with a slightly different feel to it. Buy it on iTunes (or hear longer preview).